Maybe you enjoy the occasional drink, and maybe you’re a teetotaler. Either way, you might agree that a state’s policies towards drinking provides another insight into its general moral and interventionist approach to how the state feels it should regulate the lives of its citizens. Perhaps the point that we are most sensitive to is whether the state feels it should reach into a person’s private house, family customs and religious practices and forbid any underage drinking, even as part of normal family life or religious ceremonies. The assumption that the state knows better than parents about what is best for a child is an aggressive assumption at the best of times, and while there are occasionally tragic and egregious examples of how some parents show they don’t do a good job of caring for their children, there are also statutes to cover such practices. A ‘lowest common denominator’ imposition on a total blanket ban on any type of drinking for people under the age of 21 seems regrettable, and we’re not even going to start along the lines of ‘you can vote, you can drive, you can serve in the armed services, you can marry, but you can’t have a drink at your own wedding’, although we’re very sympathetic to the comment. Suffice it to say that blanket bans on alcohol consumption because a very small minority abuse alcohol makes no more sense than blanket bans on firearms for similar reasons. Let’s look at what restrictions states pose on so-called ‘under age’ drinking and on alcohol related issues in general. But first, a bit of history is in order. With the repeal of prohibition in 1933, states were allowed to set their own alcohol laws. Most states set 21 as the minimum age to drink in public. In 1971, the 26th Amendment lowered the voting age to 18, and at that point, 30 states lowered their minimum drinking age – perhaps to 18, or in some cases to 19 or 20. By 1982, that number had grown to 46 states allowing a lower than 21 minimum drinking age. But in 1984 the National Minimum Drinking Age Act gave a backdoor ability back to the federal government to regulate a national minimum drinking age. Although not empowered to set a national drinking age, and in an attempt to avoid violating the 10th Amendment (reserving such powers to the states themselves), the federal government said ‘You are free to set any age you like, but, oh, by the way, if you don’t set the age to 21, we’ll reduce the amount of federal highway funds we give to you by 10%’. No state wished to lose out on these large annual grants (back then, some states were getting up to $100 million annually and these days it is much more), and so all 50 states quickly revised their minimum drinking age back to 21. This gives the United States the county in the ‘developed world’ with the highest minimum drinking age (next comes Iceland and Japan, both with a 20 age limit). Interestingly (and we’ll let you ponder this without our prompting) restrictions on drinking alcohol is of course something we have in common with some of the most severely Muslim nations. Five states have an outright ban on all underage drinking, no matter what the circumstances or situation. These five states are Alabama, Arkansas, Idaho, New Hampshire and West Virginia. If you’re considering a move to the ‘American redoubt’ states, you should note Idaho’s inclusion on that list. The other redoubt states are considerably less intrusive on your private personal lives, at least when it comes to alcohol. 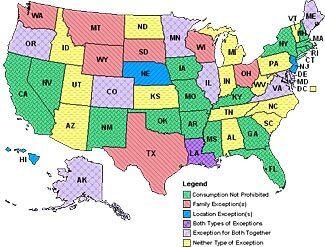 The other 45 states all allow for one or more exceptions to their underage drinking laws. These include on private, ‘non-alcohol selling’ premises and with parental consent, or even without parental consent, on alcohol selling premises with parental consent, for religious purposes, for medical purposes, and several other categories of narrow applicability as well. You can see a complete list here. If you’d like to see how the US compares to other countries, you can see a list of 138 different countries and their policies here. Another area where states feel they need to mandate ‘morality’ or in some other way control our lives is by restricting our ability to buy spirits on a Sunday. Twelve states have an outright ban on Sunday sales. These are Tennessee, Texas, Utah, Oklahoma, Alabama, Mississippi, Montana, Minnesota, Indiana, North Carolina and South Carolina. A special mention goes to Indiana – it bans all alcohol sales – not just spirits, but wine and beer too, on Sundays. Here’s an interesting map showing state by state Sunday spirit policies. Some states restrict the sale of variously beer, wine and/or spirits, requiring them only to be sold through dedicated outlets, possibly state-owned. Others are less restrictive. And whether liquor can be sold anywhere or only through specific outlets, some states have a department that controls perhaps the wholesaling or retailing of spirits (reasonably common) and possibly wine and beer too (less common). This page has a good summary of the relevant laws, state by state. In addition to state-wide laws, there can also be even more restrictive county and/or city laws. In particular, there are a number of ‘dry’ counties that may restrict and ban the purchase and/or consumption of alcohol in that county. There are also dry towns and cities. This page seems to have the most complete list of counties, cities and townships that are dry. There are probably going to be both federal and state laws to consider when it comes to making your own booze. Let’s start off with the bad news first. It is illegal to distill your own spirits without a federal license. It is also illegal to own still apparatus. You can’t even make vinegar without a bunch of paperwork, because vinegar goes through a stage where it is alcohol rich but not yet sour enough to presumably discourage guzzling it down! It seems fair to say that the restrictions on distilling spirits remain as strict today as they ever have been, and while there are plenty of books out there about how to make your own spirits at home, they don’t do you a service by failing to highlight just how illegal the activities they are encouraging you to do actually are. It is rare to see any government department admitting that their paperwork requirements are cumbersome. Bottom line – they really don’t want you distilling your own spirits. If you are caught breaking these laws, the penalties can be harsh and may possibly involve imprisonment. However, the news is more positive when it comes to wine and beer. Federal law allows you to make 100 gallons of beer per adult, up to a maximum of 200 gallons per household, each year, but for personal use only, not for sale, and restrictions may be imposed on taking the beer off your property. Similar provisions allow you to make the same 100 gallons/person or 200 gallons/household of wine annually. (Note that to qualify for the 200 gallon allowance, there must be at least two adults of legal age to drink in the household). State laws can be more restrictive than federal law, but it seems all 50 states now allow home beermaking (the last two states to allow this being Mississippi in March 2013 and Alabama in May 2013). We believe that when Mississippi legalized home brewing it also legalized home winemaking, but we are not sure if the same happened in Alabama. We believe all other 48 states allow home winemaking, generally in line with the federal 100/200 gallon limits. This site has convenient access to each state’s relevant legislation. It seems this main index page has not been updated to reflect the current situation in MS or AL, but if you drill down to the specific state legislation, you’ll of course get an accurate understanding. We make no moral judgments about anyone’s alcohol consumption, although clearly there are people with an alcoholism problem and that is regrettable. But we have two general comments to make. The first is that there is absolutely no evidence at all to suggest that greater restrictions on alcohol have any positive effect on the alcohol problems in a community. There are clear regional differences in alcohol use, as shown in the data here and this more extensive data here. But our sense is that the regional differences are a reflection of regional lifestyles and values more than they are of varying rules and restrictions. In other words, perhaps the less that people drink by choice, the more restrictive a set of conditions they may impose on themselves, and their lower levels of consumption reflect not the legal constraints but rather personal preferences. Our second point is to observe that we feel it is as unwelcome a state intrusion into our private lives to mandate when and where and how we can buy and consume alcohol as it is to restrict our firearms ownership or other similar things. It seems entirely possible to us that the more active a state and county is in controlling how its citizens can access and consume alcohol (ie the more it is a ‘nanny state’ and feels it knows best what its citizens can and can’t do, and the less it trusts its citizens to make their own choices), the more empowered the governmental authorities will feel themselves to be when it comes to doing other things ‘for our own good’ too, either during normal times or during a crisis. One further point about this, in case you care. We are Christian, and we understand what is required to live a Christian lifestyle. We are happy when other people live their lives and follow similar values to our own. But we completely fail to see any authority in the Bible that empowers us to impose our Christian values on other people, whether they wish to follow them or not. People who claim Biblical authority to constrain the lives of other people are, in our opinion, no better than Muslim extremists who claim the Koran allows and encourages them to wage their war against ‘non-believers’. Being a New Testament Christian is all about honoring choice and freewill, not about forcing people to do anything insincerely. While we do indeed like to be in a Christian community, we would not want to be in one which ended up as a severe theocracy, imposing some person’s opinions about how people should lead their lives. Let’s allow us all the freedom to do as we wish, whether it be owning firearms, storing food, making/buying/drinking alcohol, or whatever else that is and should be private and personal. So, to summarize what has become a lengthy summary, how a state (and county) seeks to restrict and control its citizens and their access to alcoholic beverages might, for some of us, directly influence where we establish a retreat, and for others of us, might provide a weak insight into how aggressive the state/county currently is and may be in the future at generally intruding into the private lives of its citizens.